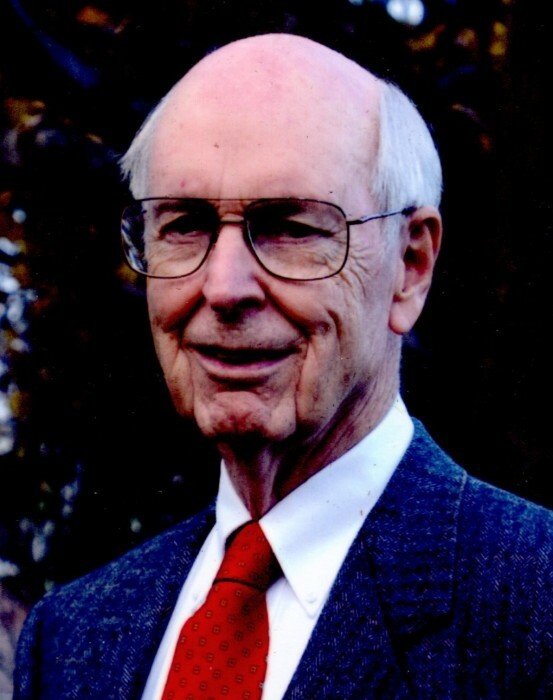 On March 19, 2019, James Edward Mackey of Tallmadge passed away peacefully at home surrounded by his family. Jim was born November 17, 1930 in Akron to Edward James and Mary Shull Mackey. He graduated from Stow High School in 1948 and from University of Mount Union in 1952, the alma mater of both his parents and his sisters. Jim was an active member of Alpha Tau Omega, lettered in baseball, and made many lifelong friends. Jim worked as a management engineer at Goodyear Tire & Rubber Company for 42 years where he met and fell in love with Carolyn Geneva Atwood. They were married March 19, 1955, in the Historic Congregational Church on Tallmadge Circle. Together, they raised a loving family in the home built for them by Carolyn’s father and brother on the farm in Tallmadge where Carolyn was born. After retirement, Jim spent the next 14 years taking Geography classes and volunteering in the map department through the KSU Senior Citizen Guest Program. Jim was an active participant in local community organizations, including the Tallmadge Public Library, the Tallmadge Historical Society, and The First Congregational Church of Tallmadge. Jim published a book about the Wright Family of Tallmadge in close collaboration with Carolyn and his mother-in-law, Geneva Wright Atwood. Jim also enjoyed hiking the Summit County Metro Parks with Carolyn and attending Cleveland Orchestra concerts at Blossom Music Center as well as the Akron Symphony. In recent years, Jim and Carolyn enthusiastically participated in Silver Sneaker classes and walking the track at the Tallmadge Recreation Center. In addition to his devoted and beautiful wife, Carolyn, Jim is survived by his sister, Jane Mackey (Donald C.) Barrett of North Canton; three children: Christine M. (W. Thomas) Farquhar of Bexley; Karen M. (Thomas J.) Horton of Vermillion, S.D. ; and Edward James (Renee C.) Mackey of Raleigh, N.C.; eight dearly loved grandchildren: Allison Horton (Jeffrey R.) Piedmont of Stamford, CT; William Mackey Farquhar of Columbus; Elizabeth Catherine Horton of Vermillion; Robert Atwood Farquhar of Columbus; Robert Edward Horton of Vermillion; Mary Caroline Mackey of Raleigh; James Edward Earnest Mackey of Raleigh; and Caroline Geneva Horton of Vermillion; one very special great-grandson, Ryan Warren Piedmont of Stamford; and many loving nieces and nephews. Jim was preceded in death by his parents, Edward J. and Mary S. Mackey, and his sister and brother-in-law Ann M. and Robert C. Koch. In accordance with Jim’s wishes, there will be a celebration of Jim’s life at the Historic Congregational Church on Tallmadge Circle on Saturday, March 30, 2019, at 3pm. A reception with the family will take place in the Olde Town Hall after the service. In lieu of flowers, donations may be made in Jim’s memory to The Edward J. ’24 and Mary Shull ‘27 Mackey Scholarship Fund at University of Mount Union, 1972 Clark Ave. Alliance, OH 44601, to The First Congregational Church of Tallmadge Endowment Fund or to the charity of your choice.